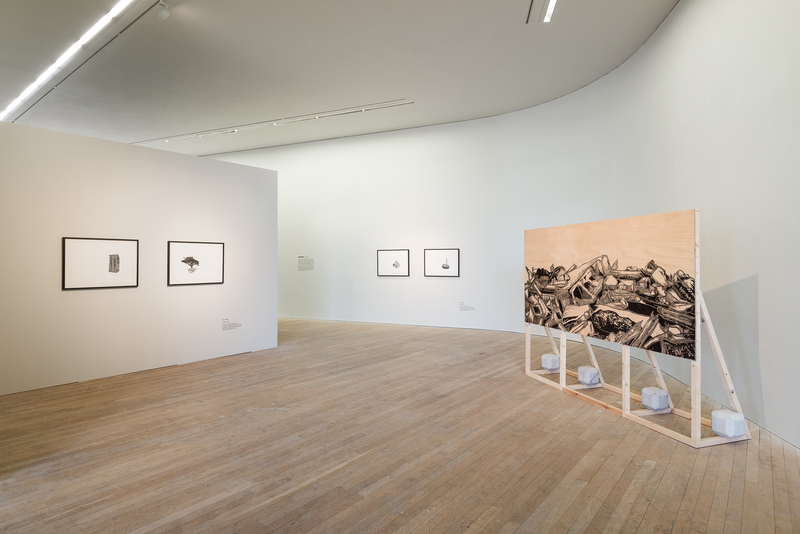 Fiona Kelly, born in Westmeath 1985, is a multidisciplinary visual artist whose research into wasteland and abandoned spaces alludes to disposability, ecology and the interim. She holds a MA from the Crawford College of Art & Design. Kelly’s work explores the architectural potential of re-appropriated materials in a state of rejection; waste concrete from demolition sites, recycled glass, cardboard, plywood, bitumen and limestone dust. Kelly alters these foraged remnants, the by-products of the urban landscape, to visually narrate what she considers to be modern fables for the Anthropocene. Her work has been exhibited in Ireland and internationally, most recently in The Dirt That Measures All Our Time, (Solo) Mermaid Arts Centre, Wicklow, IRE; Stampa Ora, Crawford Art Gallery, Cork, IRE; Visions Of Half-Light, Macroom Town Hall, Cork, IRE; Double Take, GLUCKSMAN Gallery, Cork, IRE, Curated by Chris Clarke & Fiona Kearney; Sustainable Futures, Sirius Arts Centre, IRE, curated by Claire Ryan; The Great Heap, (Solo), Awarded Exhibition Residency, Leitrim Sculpture Centre, IRE; The Dispersed Gallery, Middlesbrough Art Weekender, U.K, curated by Liam Slevin & Paul Stewart. Kelly is represented in the collections of the University College Cork, OPW, C.I.T and in the Jyväskylä Museum of Art Finland.